A website is a small investment that undoubtedly brings good economic performance in the short, medium and long term for any company. In a simple way, we could list hundreds more reasons why it is essential to have a web presence on the Internet constantly. We will present 10 good reasons why any company, or self must have a professional website. If we remove that little expense of our website we are losing the opportunity to save on other aspects. We communicate with our customers and / or most economical provider without move through our corporate email (no Gmail, Yahoo or Hotmail does not reflect the company brand). But we can also refer to our messages to any part of our website (copying and pasting a link) where a person can find more information about a particular product or service. A website provides information about our company, products and services permanently, because the Internet never closes, so our virtual showroom operates 24 HOURS A DAY, 7 DAYS A WEEK AND 365 DAYS A YEAR, and from anywhere the world. Visitors and potential buyers are able to view our catalog of products and services at their convenience and no matter where they are. In addition, we know which products are most interesting specifically controlling web visits. Only saving on the cost of printing a catalog of products and service is worthwhile role: exponential increase dissemination and cut spending to a minimum. In addition, we complement other Internet services in which we are discharged as Yellow Pages or business directories. On the website of our company we are able to put as much information as you want. Therefore, the web becomes an inexhaustible source of information for prospective customers who wish to learn more about our services and products before ordering online or visiting the company. And with our website, we can very simply update information about our products and services. We no longer need “re-print” over and over again all our documents advertising or promotions to consider a new product or service offered by our company: just update one or more of our web sites. No time out of print, broadcast and no cost reprint, update instantly to worldwide. It is important to be present on the Internet as soon as possible to prevent our potential customers away to competitors that you have your website. Today, more and more people consult the Internet before making a purchase. We should not assume the cost of losing customers, but to have as our website, before it is too late: first come first arrives twice. A WEBSITE INCREASES THE CREDIBILITY OF THE COMPANY. The simple fact of having a page increases our credibility and gives your company an image of innovation, novelty and professionalism. For some it will be when the biggest companies have websites, and even most modest independent professionals have their own. Our customers will also have the feeling that our company does not hesitate to invest to better serve them. On the other hand, have no website or have it abandoned and outdated, certainly harms the image of our company. Thanks to search engines like Google, Yahoo! or Bing will find many products in one click more easily and accurately than in the Yellow Pages, as more and more those who use the Internet to plan their searches. Unlike purchased advertising space in a magazine or newspaper (visible a day or a week), our website will be visible all the time you want. In addition, we make advertising campaigns, at minimal cost compared to traditional media through new channels of Internet advertising: Our website is our essential card. The secret is in communication, especially with customers through the Internet website and expose us to new ideas, enabling a more agile and evolve into new product lines or services in which we had not previously repaired. Internet has millions of users, and thanks to our own website, we are able to open the doors of our business to a huge community of Internet users without having to invest in any physical store around the world. It can be an opportunity to give a twist to our business that will breathe new life. Moreover, through our website, we have the opportunity to find new niche markets which we did not reach before and are now closer than ever. We just have to dedicate to the site the same time that we would devote to any business tool. For a minimal cost, Internet allows us to offer an additional service customer who otherwise would be a very high expense. Many of our potential customers find valuable information on our website and as a result should not make a phone call or navigate to our office for more information. The website also allows us to track the pages you see our customers valuable information about your interests that we can analyze later. This information allows us to tailor our products and services to market needs. Our website allows us to present the latest news about our company. and the latest promotions, launching a new product or opening a new branch. The web tools and email us straightforward to develop a list of clients or prospective clients that periodically contact over the Internet. It is easy to realize that having a website means having an amazing communication and promotional tool at a price much lower than any other printed or audiovisual. Those business strategies have always wanted to adopt in our company, such as geographic expansion are now possible thanks to the Internet. With our website we look for partners and similar companies in other towns with which alliances and thus give greater service in more territory, always with the possibility of communicating via the Internet at low cost. Furthermore, we can meet distant suppliers that offer us a discount on prices of products go to market then. If it is something that has Internet is that it is a COLLABORATIVE NETWORK. Screen resolution, pixel density, tilt angle, phone or tablet…these are all things that weren’t even a concern a couple of years ago. Now, with mobile usage rising more and more everyday and projected to overtake desktop usage just about the time we hit peak oil, it’s more important than ever to consider how your users will find you on mobile devices, and how they’ll react to your site once they do. You run a cafe that specializes in freshly baked cupcakes and the freshest coffee in town. Your desktop site tells people all about that, lets them buy gift cards online (you don’t sell your products online, we said “Teh freshest!” and you pride yourself on that), and read updates from your blog on what goes on in the kitchen, recipes, and the latest news from the region where you get your coffee beans. That’s great! It sounds like you’re really on the ball about making your website a place where people will want to visit, and then turn into customers at some point. Now imagine that Mindy Sue is out and about walking the streets with her iPhone. Suddenly she has a craving for a cupcake and a latte. Through good SEO, when she searches for coffee shop pittsburgh, you’re the first result. Wow, you’re really on top of things! But when Mindy Sue loads up your site, she can’t seem to find the address. Or the phone number. They’re buried away in some tiny link somewhere on the site which, with such a small device, is just too hard for her to find. In the meantime, she stumbles across Starbucks #48901-a and figures, “Oh well, this is good enough.” Chalk another one up to corporate chain density. Now consider if your site had been optimized for mobile. The phone number and a link to Google Maps, where Mindy Sue could’ve easily gotten directions, could have been front and center. Perhaps you could display the brewing times and “fresh out of the oven” times when you last put on a pot of coffee or pulled some delicious Red Velvets out (all which could be updated with a quick text message from you, which would in turn update your website). Mindy Sue then would have known where you were, exactly how fresh your coffee really was, and been directly on her way over. You could’ve made it easy for her to update her Facebook status, and then her friends would have shown up, too. And Mindy Sue’s got over 2,000 friends on Facebook. You’d’ve sold out your whole stock and could’ve taken the weekend off! Great ideas like this and more could all be coming your way, just get in touch with me so we can start bouncing them off of one another. Did you know 111.2 million consumers browse the web on their phones? Let your clients find you from wherever they are by going mobile! Online research has raised faster than expected using the mobile phones thanks to the freedom it gives everyone to access and research any information anybody needs without having to go back home and use their computers. Reinforce your brand with a mobile version. Let everyone see your site from wherever they are whenever they think they need your help. The Marketing Beast offers its help to get your business ready for the internet from wherever you access it from, however anybody plans to get to you and contact you on the go. With Mobile Web design moving into the mainstream market, businesses are able to provide a richer user experience for their customers. Don’t get left behind! 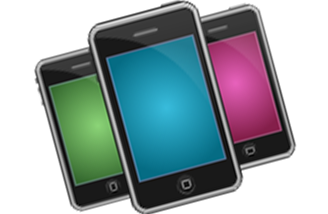 Gain a considerable lead on your competitors with a custom mobile website. Take the need for browsing out of the equation by contacting us about developing a custom mobile application for your business. From concept to completion, we work with you to create a visually impressive and fully functional application to increase the value of your business. We’ll create your application to work in conjunction with your mobile site, creating endless opportunities for customers to contact you, increasing your accessibility and raising brand awareness globally. A strong mobile presence is becoming a necessity for businesses and combining our mobile web design services with a mobile application will establish your position as a progressive competitor.